Barcelona, September 21th, 2017 – iVascular S.L.U. 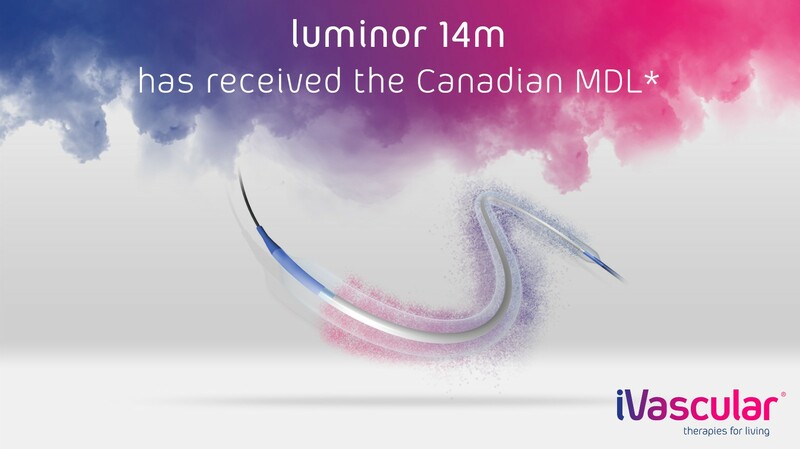 has announced that Luminor 14m, the Drug Coated Balloon (DCB) indicated for below the knee BTK arteries, has received the Canadian Medical Device License (MDL). Luminor 14m is a Paclitaxel Coated Balloon specifically designed for BTK indications, thanks to its extra low crossing profile combined with TransferTechTM, iVascular proprietary technology for drug release. Earlier this week, the clinical data of Luminor DCB was presented during CIRSE 2017 in Copenhagen. EFFPAC Randomized Controlled Study (RCT) enrolled 171 patients at 11 German centers who were randomized to treatment with either the Luminor DCB or PTA. The comparison with other published RCTs, underlined that Luminor DCB demonstrates higher efficacy than most other available DCBs.